Mia Corvere has found her place among the Blades of Our Lady of Blessed Murder, but many in the Red Church hierarchy think she’s far from earned it. Plying her bloody trade in a backwater of the Republic, she’s no closer to ending the men who destroyed her familia; in fact, she’s told directly that Consul Scaeva is off limits. But after a deadly confrontation with an old enemy, Mia’s suspicions about the Red Church’s true motives begin to grow. 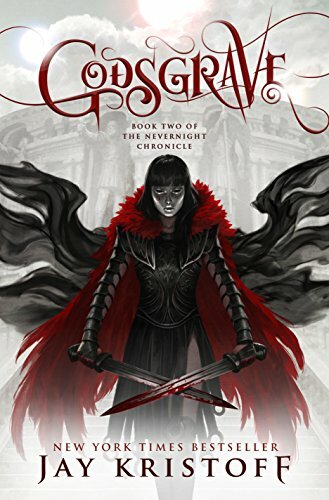 Sexier, grittier, fiercer, bloodier—Jay Kristoff’s GODSGRAVE is an action-packed showstopper. In this highly anticipated follow up, Mia Corvere’s quest to avenge her family takes some unexpected turns along the way. After the blood bath at the Red Church, Mia is no closer to enacting retribution on the powerful men who destroyed her family. She then learns—from the unlikeliest of sources—some disturbing truths about the Church. A new plan takes shape… this one far riskier than anything she’s taken on before, especially as it means trusting an old enemy. Defying her commitment as a Blade of Our Lady of Blessed Murder, she sells herself to the gladiatorial collegium to get one chance at ending Scaeva and Duomo. As a gladiatii, she must fight to the death ruthlessly. And amidst these battles, on the bloodied sands of the arena, she forges unexpected friendships and alliances that complicate her quest. She also makes new enemies, one with a familiar dark affinity, inciting new questions about her own nature. But as we’ve come to know of this brutal world, nothing is ever as it seems and new truths emerge that change everything. By the flip of the final page, you’ll be wide-eyed and slack-jawed, clamoring for the next installment in the series. Gentlefriends, be ready. Godsgrave thrums with unrelenting tension and suspense and you won’t know what to do with yourself once it’s over. Total badassery done right.